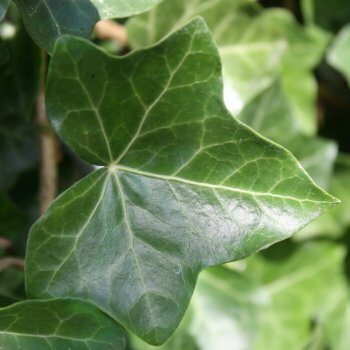 A lush evergreen climber, Irish Ivy is ideal for covering any unsightly surfaces. Hedera hibernica can also be used as ground cover, simply pin down the roots to achieve this. This variety of Ivy has dark green, 5 lobed leaves and produces green flowers in autumn and black berries in winter. This evergreen climber provides winter food for late foraging bees and birds. Hedera hibernica can grow in full sun to full shade and prefers a moist, well-drained soil. This Ivy variety will make a great addition to any garden whilst providing much needed sustenance to British wildlife through winter. As the sap of Irish Ivy can be quite irritating, please wear protective gloves whilst handling if you have sensitive skin. Our plants are sold on 6ft canes ideal for training up walls and fences. Browse other climbing plants here. When planting Evergreen climbers, such as Hedera Hibernica, it is important to prepare the planting area well. Pot grown evergreen climbers can be planted at any time of the year. Firstly, remove all weeds and grass within a metre of your desired planting hole then dig a hole as deep as your root mass and approximately 2x as wide. We recommend digging a square hole as this encourages the roots to grow straight as opposed to around inside the hole. To help your tree establish more effectively, we advise applying root grow (sprinkle in the hole for pot grown trees or prepare and apply the gel mixture for bare root trees), especially if you have poor soil. Gently loosen the roots and place into the planting hole. If your soil is poor, mix 50% of the original soil with 50% high quality compost, fill in the hole and firm around gently. Make sure not to bank the soil up around the collar of the tree as this can cause problems. We advise planting young trees with a stake and tie kit. To see how to use a tree stake and tie, watch our informational how to videos. If you’re planting in dry weather, water well and regularly for the first few months. The same goes for spring and summer planting. Make sure to keep an eye on your young tree and increase watering if there are extended periods of hot or dry weather. If you’re planting in autumn, you may only need to water your tree a little. We also stock a range of irrigation kits, suitable for a variety of planting schemes. Once planted, it is important to keep the area free of competing weeds and grass for the first couple of growing seasons. Using a glyphosate based weed killer or installing mulch matting and bark chips will aid in this. Do not simply mow the grass around the area as this will only encourage it to grow more vigorously. If you know your area is prone to rabbits, we would advise using a rabbit guard. Ivy plants do not require a lot of pruning. Simply remove any dead, diseased or awkwardly placed branches from your Lawson's Cypress Columnaris Glauca tree as and when you see them.